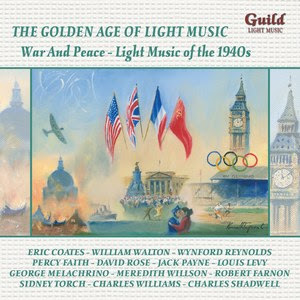 In retrospect it is clear that the 1940s had a major impact on the way in which Light Music would develop in the remaining years of the 20th Century. The somewhat genteel world in which many composers involved in the genre were living was shattered when World War 2 broke out in September 1939. Although their style of music would still be appreciated, it had to compete with other developments which would invigorate what some believed was a fading niche of the music scene. A fresh impetus was provided by the likes of David Rose, George Melachrino, Percy Faith, Sidney Torch and Robert Farnon - his very first composition for Chappell is included in this collection. Notable film scores also rub shoulders with a rare Concerto for Piano and Orchestra - “El Alamein”, composed by Albert Arlen in tribute to the soldiers who fought in North Africa.